In many places around the world, introduced breeds and varieties are promoted with the promise of high yields. But when a community reflects on their past and their opportunities, they are likely to see that high yields may not compensate for the high costs of external inputs such as extra medicines, for the loss of taste and nutritional value, or that of the cultural value associated with the crop or breed. In Uganda, there is a grim realisation that along with the loss of the Ankole Longhorns, cultural traditions and indigenous knowledge about animal breeding are also disappearing. There has been a spirited effort to re-educate the local people about the importance of ensuring that the Ankole Longhorn does not become extinct. Their horns can grow to 8ft long. The horns are extremely useful because they assist the cows with their blood circulation. The horns also keep them cool in hot weather. The Ankole Longhorns are probably one of the oldest indeginous species in the world. 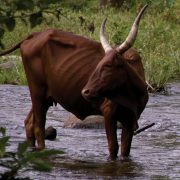 It is thought that they are a cross between two different breeds of cattle that migrated to East Africa around 1000 BC. They have a lifespan of up to 20 years. This is so because they rarely fall ill and they can withstand drought and extreme weather conditions. Their dung, urine and even milk are used for various medicinal purposes.